Casper’s mattresses may be some of the most popular bed-in-a-box products on the market today, but how does their Casper pillow compare to similar competition? Our Casper pillow review hopes to answer that question. We’ll be breaking down Casper pillows and talking about their benefits, who they work best for, and how it compares. 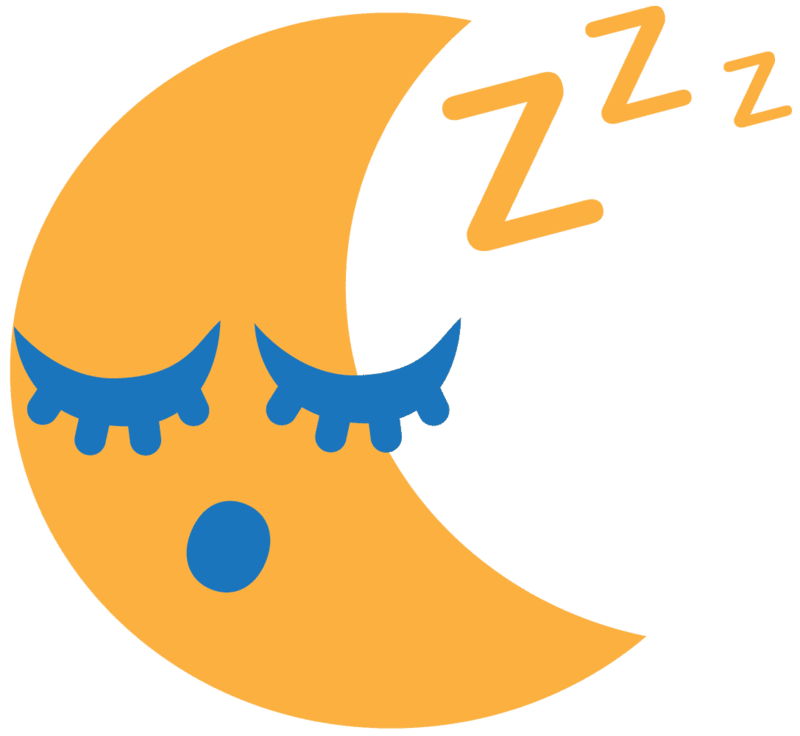 Afterward, we’ll let you know whether you should buy or pass on this pillow, based on your preferred sleeping position and similar habits. What Makes Casper Pillow Unique? Casper—be it in their mattresses, pillows, or other products—likes to make a product with a feature that sets it apart from the rest. When it comes to the Casper pillow, that feature is actually a second pillow. Casper’s pillow is designed with a large, thick outer shell that serves as an outer pillow, of sorts. The marketing refers to the pillow itself as the inner pillow. The entire assembly is required to use the pillow, and results in a pillow within a pillow. While this “outer pillow” functions in much the same way as a thick outer cover, it certainly does bring a unique element to this product. This outer pillow can be removed for quick washing and makes maintenance a breeze. This design also allows for the company to make a firm center and a plush outside, which ends up providing tons of support. In fact, even when compared to similar competition, we’re hard-pressed to find a pillow that comes with as much support as the Casper pillow. Casper’s marketing doubles down on their claim that this pillow-in-pillow design means that there’s something for everyone to love about this pillow. The firmness helps back and side sleepers while the plush exterior is said to help stomach sleepers. When it comes to side and back sleeping, we tend to agree with Casper’s claims. The exterior pillow is plush enough to keep most from feeling the firm inner pillow. However, that inner pillow is responsible for the support needed to maintain neutral spine alignment. So if you sleep in these two popular positions, Casper has you covered. For stomach sleepers, however, you might be a little put off by the sheer size of this pillow and would like to opt for a thinner option. The Casper pillow really only comes in one size—standard. There is a King size available for a marginal fee, but the difference in size really only benefits those with larger beds who really want that extra boost of height from an already very large pillow. This lack of choice is a little frustrating – especially for stomach sleepers that might love the feel of this product but be a little wary about the height. Still, two size options is better than one, and the standard Casper pillow size is optimal for just about every situation. What is Casper Pillow Made of? 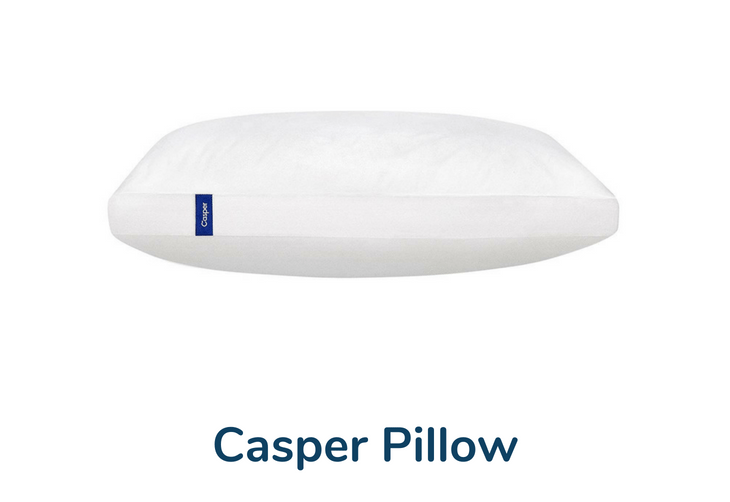 According to the official Casper website, the Casper pillow’s cover is made of 100% cotton. The pillow itself uses a polyester microfiber fill and is held together by polyester fabric. This design prevents the pillow from suffering from the off-gassing that Purple and other memory foam pillow users experience, so if you’re hypoallergenic or just dislike the scent that can come with memory foam, the Casper pillow is a good option for you. 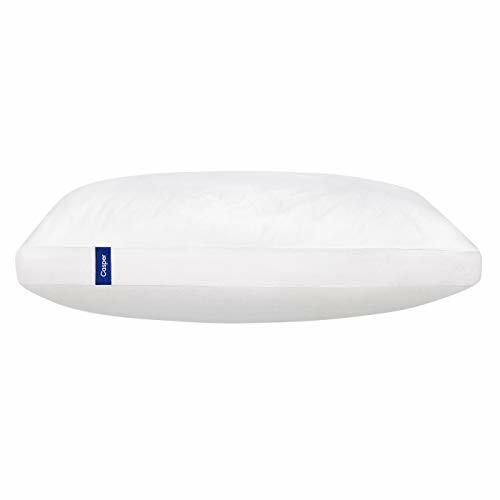 Currently, the Casper pillow retails for 75 dollars—which is a considerably high price for some, but places it alongside the likes of Purple for a premium pillow. The king version of the Casper pillow is 95 dollars. Other specialty pillows – like MyPillow – are cheaper, but may not come with the same easy-clean design as the Casper. For similar options, check out our Bamboo Pillow review for products at a different price point. Is The Casper Pillow Machine Washable? Yes! Casper specifically designed their pillow-in-pillow product so that removing the outer shell is a breeze. Pull the outer pillow away from the inner pillow and place in the wash regularly to maintain a fresh scent. One of the slight issues with the Casper pillow’s washability is that you’ll need to spend some time fluffing after a wash, even if this product dries quicker than most. Where to Buy Casper Pillow? Casper pillows can be bought directly from Casper’s website and is also sold through online distributors like Amazon. In America, you can find the Casper pillow for sale in many Target stores across the county. While the price is usually the same, you may find online retailers selling the product at a significant discount. Be sure to keep an eye out to find the best price for the Casper pillow. At this price point, Casper places itself in direct competition with the marketing giant and fellow mattress maker Purple. Purple’s brand name recognition and viral marketing schemes have more than sold the proprietary polymer that makes up their products. Using the Purple pillow (especially when compared to the Casper pillow) would take some getting used to. Purple’s design relies on a grid-like system that can feel heavy and difficult to maneuver around. The Casper pillow offers a traditional, plush feel. However, the Purple pillow is both slightly more expensive and doesn’t come with any adjustable parts or different sizes. You get what you get with the Purple pillow, so for personalization’s sake, you may want to aim for the Casper pillow instead. We recommend taking some time to consider your sleeping preferences when it comes to picking between the Purple and Casper pillow. The Casper pillow is going to sleep warmer and feel more plush than the rectangular, cool Purple Pillow. If you’ve never used a Purple pillow or felt a Purple product, it might be worth seeking one out before making a decision between these two pillows. Purple products have a very love-it-or-hate-it reputation, and are best sampled before purchase. If you’re concerned about warranties, however, it is hard to go wrong with either. Both Purple and Casper offer lengthy warranties and return periods to make sure you like your investment. Considering the cost of both, we recommend taking them up on their offer. So, who should buy the Casper pillow? If you prefer stomach sleeping, like a firmer pillow, or you’re working on a budget, we can think of a few better solutions you might want to check out before considering the Casper. However, it is hard to go wrong with the plush support of the Casper pillow for any side or back sleepers. This pillow’s design and functionality make it a worthy investment for anyone who needs a pillow to last for the years (and the nights) to come.